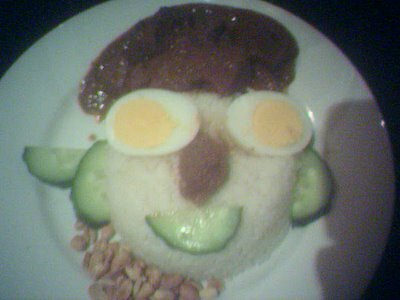 Tonight: the opening of the Contemporary New Zealand Photographers (including Mr Ben Cauchi) then on to dinner at Satay Kampong where I rearranged my delicious and colourful Nasi Lemak. Isn't it a cute looking dinner? Then I ate the little fucker. We took a trip to Boogie Wonderland and drank more wine and danced to silly 70s and 80s music. I dropped my poor dear Angie on the floor during a Fame kind of moment. I hope she recovers. Oh Rose you have me laughing, because I want to think it was Bowie's Fame, but I'm guessing it was "I want to learn how to fly-high" Fame. No, there were unfortunately no Bowie moments - it was all Gloria Gaynor, Stevie Wonder, Bee Gees etc. Shameless dancing on a Saturday Night Fever-inspired flashing dance floor. Wine helped, and the fact that there was nobody there we knew. I feel a little under the weather today. ... and he was a tasty little fucker!